Make that winning hit an occasion to remember by showcasing it in a stunning glass frame! Every youngster has memories of a great winning hit, and you can now capture and keep it on display for all to see with these stunning glass frames. With a unique softball theme, the frame is made from glass and features a hand drawn softball glove and ball painted onto the left hand side. The right hand side will hold a standard picture sized at 4" x 6". These frames make ideal gifts for family living areas and school sports rooms. 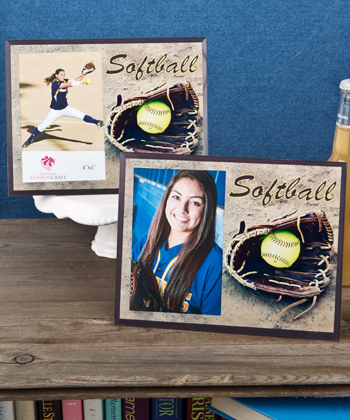 Make your little softball player into the hero of the day with a meaningful and feel-good themed frame! Perfect to showcase that winning throw!